I've been waiting a long time to look for the death of my great grandpa Alexander McGinnis. I knew he died in 1935 because the year of death is on his tombstone. Mind you, his year of birth on his stone is incorrect (I have his church baptism records as proof). The stone was erected by his eldest daughter Mary Sheward and I figure she may have been confused about his year of birth but she surely knew when he died! Finally Ancestry.com has updated the death records to include 1935. I was pretty excited to search for Alex as there's a bit of a story about him. My dad, who was Alex's grandson, never met his grandfather and grew up believing that Alex was long dead. One day my grandfather came downstairs wearing a suit and tie - which he never did, and my dad asked him jokingly if he was going to a funeral. According to my father, his dad replied "Yes, my father just died" and then walked out the door without another word. My father was stunned. He was 23 years old and never knew his grandpa was not only still alive but lived just a few miles away. Eventually my father got part of the story from his dad - that Alex and his son Joe (my grandfather) had a huge argument and falling out in the early 1900s and never spoke again. So for over 25 years my grandfather and his father were estranged, and my father never met his grandpa. Never knowing much about Alex, I was quite curious how and where he died. The death certificate stated that he fell down a flight of stone steps (most likely leading to his basement), broke his neck and was in hospital for 17 days before succumbing to his injuries and pneumonia. I felt very sad reading this, and thought about his son, my grandfather, probably knowing that his dad lay seriously injured in the local hospital but not going to visit him. What a sad way to live one's life, with arguments and estrangements and pretending that family members don't exist. Perhaps I'm being harsh but it seems hypocritical to me for my grandfather to then attend his dad's funeral. His dad and mother separated when the children were young and his mom had died several years before his father. So it's not as if he went to offer support and comfort to his mom. Oddly enough I confess that I feel anger at my grandfather for not letting his sons grow up knowing their grandpa. Perhaps I'm misjuding him, perhaps it was his father Alex who refused to give in. Who ignored who? One of life's mysteries and one which I will likely never know what the truth was. To me it all boils down to stubborness and pride and it's a terrible waste. I think of all the photos I have of Military ancestors, this one of my Uncle Ern is one of my favourites. Ernie was my grandmother's brother and he left England for Toronto Ontario Canada in 1908. 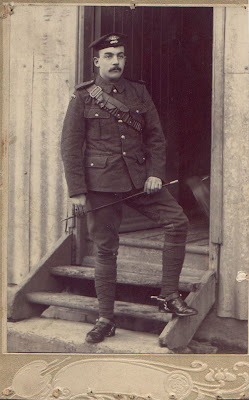 He was in the military in England (The Kent Buffs) and again in Canada, and in this photo he's at Stanley Barracks in Toronto during WW1. My family has a long military history. My father was a Lieutenant during WW2, one of my sons is currently serving in the Canadian military. I'm descended from two Loyalists who fought on the British side during the American Revolutionary War, from soldiers who fought during the War of 1812 and from men who fought in many wars and skirmishes over the centuries. I remember them all and thank them for their sacrifices. Success and a happy ending! 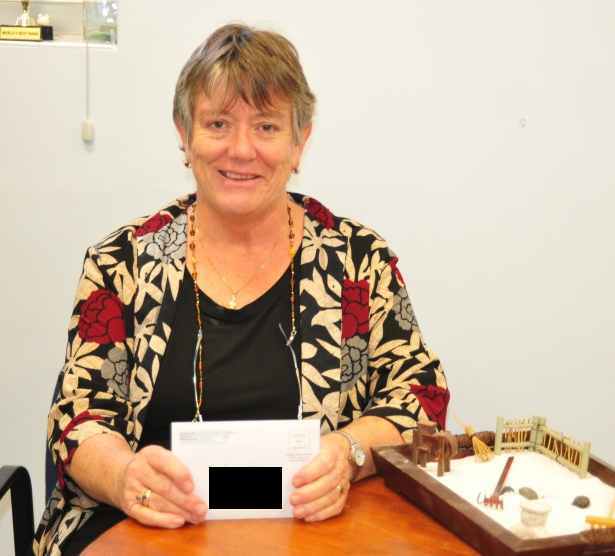 Jill from Australia has mailed Randall Packard's lost dog tag from WW2 to his daughter in America. Here is Jill with the envelope ready to go! I asked Jill how she came to find Randall's Dog Tag as well as Stanley Thompson's and here is her reply. It's fascinating and Jill deserves a huge thank you for her efforts. My husband and I have had a interest in the many deserted sites of WW11 in the Northern Territory for about 25+ years. We have been to many crashed aircraft site and many of the camps set up as part of the Pacific war. Fenton air strip was one of the larger ones and had a group of Americans stationed there for a period of time. There was a mulititude of services provided on the base, including a visit from Bob Hope in Nov 1943 to entertain the 380 Bomb Group. When the war finished the sites were just abandoned. Over the years some stuff was picked up for scrap and other stuff was collected by fossickers like me as something interesting. I found the two American dog tags near what I named the canteen area. In this area I picked up numerous coca cola bottles that had been left by the Americans. There were many things left and it is still possible to find something lying around in the bush. And bush it is. It is about 300km away from where I live and there is no community close by. My family had an interest with the serving Americans. During the War an American soldier returned home to his home in Wisconsin. An article was written about his time in my home town in South Australia. A lady (Rose Jahman) whose two sons were fighting in the Pacific wrote to the Mayor of the town in the hope her boys may have been there, The letter was passed to my mother who had just won a competition run by the Army Barracks to reply. My mother did and she continued to write to Rose until her death. I have been writing to her grand daughter for the past 50 years. We are still looking for descendants of Stanley Thompson so maybe we can help Jill find a family member before Memorial Day! In the mid 60's, during the Vietnam War, people bought copper bracelets with the name of a service person who was MIA. I have one that I got in 1966. I now know that the individual was removed from the MIA list and his name is engraved on the Vietnam Wall as KIA. I'd like to find his wife and/or children to give this bracelet. I have saved it for over 40 years in the hopes of giving it to a family member. So, how can I do this? I do know his name, his branch of service and other bits of information. The soldier's name is Charles Peter Claxton. Here is a picture of the bracelet that Debbie sent. I found an article about Charles and the rest of the air crew that went MIA in 1967. It stated their bodies were found in 2000 although only two were identified positively. Revised Edition Van Slyke Family in America NOW AVAILABLE! Father of Ots-Toch and Interpreter to Samuel de Champlain REVISED EDITION by Lorine McGinnis Schulze is now available for purchase. Ever since the publication of my first Van Slyke Family in America book in 1996, I have been continuing my research on this family. A few years ago I found a court record in New Netherland where Cornelis Van Slyke wrote about the death of a man in Breuckelen Netherlands. Cornelis referred to the deceased man as his brother and asked if he was in the will. This exciting discovery spurred me to hire a Dutch researcher to search the Breuckelen and Nijenrode archives for more details. His findings are presented in this Revised Edition. ca 1620 at Canajoharie, New York. Cornelis came to the New World in May of 1634, settling at Beverwyck and then Schenectady, New York. Cornelis Van Slyke's story is of a Dutchman who came to the New World as a carpenter at the age of 30, who became an interpreter for the Mohawk nation, was adopted into the tribe, and who met and married a French-Mohawk woman (Ots-Toch) who never left her native village. Their children, all raised at Canajoharie, one of the Mohawk castles or villages, became well-known and respected in the Dutch community. All except one left the village and married Dutch settlers. In the Revised Edition, new findings on the Van Slyke family in Breuckelen are revealed. New facts are added to the descendant genealogies and a few errors from the firstbook are corrected. More sources have been added and there is more detail about individuals included. There are 1,342 footnoted sources for the facts contained in this 287 page book. WW2 American Soldier's Dog Tags Found in Australia: They're Going Home! Success! With the help of an amazing group of readers of my blog, we have found descendants of our WW2 soldier who lost his dog tags in Australia some 65 years ago. The clues we had were a dog tag found by Jill in a remote area of Australia. 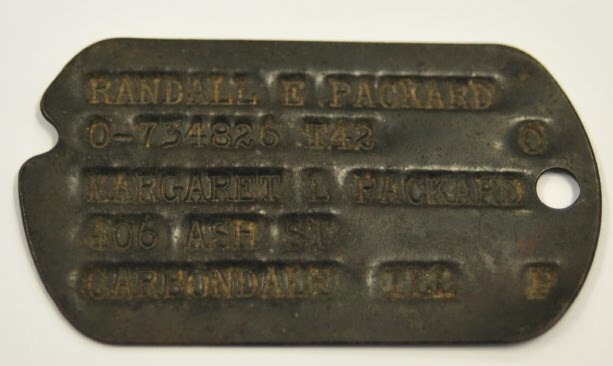 The dog tag gave us the name Randall E. Packard, his ID# and a next of kin name, presumably his wife - Margaret L. Packard, and an Illinois address. Jill asked for my help on my Ask Olive Tree blog to find Randall's descendants so the dog tag could be returned to family. So I put out a call on both my blogs and miraculously, within a day, several readers put their genealogy research skills to work and found a great deal about Randall. Then we hit gold - we found Randall's wife, still alive at age 90, and Randall's son. While I was pondering how best to approach Randall's son with the news, one of my readers (Gord) phoned Randall's wife. She was very pleased and excited and the word spread in their family. But there's more! I've been corresponding with Rev. Charles (Randall's son) and on his Church website he wrote a Devotional which I think will interest readers. Rev. Charles also shared with me an email from a former employee of Randall who wrote to Randall's son as soon as he heard about the dog tag. The email was very touching and showed once again what a strong impact Randall Packard had on those with whom he came in contact. And one last thing, Gord has offered to put together a package of materials for the family which will provide them with all the data readers found in the search, as well as the sources. What a lovely gift! So everyone who participated, give yourselves a well-deserved pat on the back! You deserve it. Now that we've had such wonderful success as a team, I'd love to do the same for our other WW2 soldier Stanley Thompson. Jill approached me for help with another find - the Dog Tag for Stanley Thompson With the help of my readers we found quite a bit about Stanley but never found a living descendant. Perhaps we can have another hunt for Stanley's family and bring the same joy to them as Randall's family found. Announcing a new website that is chock full of incredible Irish records. This is my Featured Weekly Database for this week. Don't be misled by the title! There are records here that pertain to other geographic locations. The website includes the following searchable records. I have just spent an enjoyable half hour searching the Passenger Lists and Almshouse Records. I was amazed to find that in the ships passenger lists, each individual entry is linked to the actual images of the original manifest. When I glanced at the Immigrant Letters database I was struck by the geographic locations - many in the USA as well as of course Ireland and New Brunswick. Over 2000 letters from agents to tenants in Ireland during the Famine Years have been discovered and purchased at auction in Ireland. According to an online report, the letters were found "in the archives of Dublin solicitors Stewart and Kincaid, who represented landlords such as Lord Palmerstown, Col Wingfield [Sligo], Daniel Ferrall [Roscommon], the Marquess of Westmeath, the Stratford estates of Clare and Limerick and the Frankfort estates in Kilkenny and Carlow." The letters were purchased as a group by an Irish Archives and will eventually be made available for study. Jill in Australia found another Dog Tag belonging to an American WW2 soldier. This military identification tag belonged to Randall E. Packard. His next of kin was Margaret [L.?] Packard of 406 Ash Street in Carbondale Illinois. Jill would like to see the Dog Tag go to a living descendant so let's see if we can work together and find more about Randall E. Packard and his relative Margaret L. in Illinois. Jill's previous find was the Dog Tag for Stanley Thompson With the help of my readers we found quite a bit about Stanley but never found a living descendant. Fingers crossed that we have better luck with Randall and can send his dog tags home! Why oh why can't people spell my name? We're genealogy researchers. Shouldn't one of our number one skills be the ability to copy what is on a document. Copy accurately? Not write what we think we see, or expect to see, but what is there? Let me explain. My first name as most of you know is Lorine. I have my name on the bottom of all my emails. It is on my websites. I know how to spell my own name. Therefore, my question is - why are there a significant number of correspondents who return my emails with my name badly mangled? I get Loreen. Lorrine. Laurine. Variant spellings of my name but not correct. Honestly, I do know how to spell my own name! If you see it in my email or on my website, trust me, I spelled it correctly. I also get Lorraine or Loraine. That's not even my name! That's an entirely different name. Then I get those who decide to give me a nickname such as Lori. I've never been called Lori in my life and I don't want to start now. I find it disturbing that so many genealogists don't copy things accurately. How are they ever going to find the right ancestor if they can't get a name right? And I haven't even started my rant about my surname of Schulze. It's spelled S C H U L Z E. That's right. No "T" and put an "E" on the end. It's been a long week. Maybe next week will be better? Civil War Era Burtch Family Album with CDVs (Cartes de Visites), circa 1860s. This carte de visite was not identified but was with the Burtch Photo Album. Many of the photos in the album were identified and can be viewed online at Lost Faces. Lost Faces is my collection of Family Photo Albums. One of my hobbies is going to antique auctions, stores, flea markets and garage sales. Whenever I spot one of those old Photo Albums from the 1800s with family pictures, I have to buy it! I can't bear the thought that the album and photos will be lost or destroyed. Even though they aren't my ancestors, and they can be very expensive, I can't walk away without it. MyHeritage posted their list of top 100 Genealogy blogs. I'm very pleased to find Olive Tree Genealogy blog on that list! ... recently at MyHeritage.com we've been scanning the web, evaluating content, and identifying some of the best genealogy sites on the internet right now. We put a focus on finding hidden gems in the community, so there's a good chance that some of these are sites you won't have seen before. It's a testament to the vibrancy of the online genealogy community that even this selection of 100 sites had to leave out a lot of quality content. Nevertheless, these are the 100 we came up with, presented in alphabetical order. We hope you enjoy reading them! I encourage readers to drop by their website and check out the other 99 blogs on the list. I'm sure you'll find some you didn't know about. The Missing Friends Project on OliveTreeGenealogy.com is extracting the names of those who immigrated from UK to America or Canada and who were inquired about by family in various 19th Century newspapers. Missing Friends Project starts with Lloyd's Weekly Newspaper, published in London England and their weekly column (1886-1900) called "Long Lost Relatives". We also have begun extracting names of those in the Boston Pilot, published in Boston Massachusetts (1831-1921). Our Boston Pilot project is only extracting the names of missing Irish individuals who sailed to Canada. It is important to note that many who sailed first to Canada went on to USA and are so noted in the extracts. Many of the relatives and friends seeking them were based in USA and their location is also given. Fascinating article about Annie Moore, the first person to go through Ellis Island processing station. In 1892, she was the first foreigner to arrive at Ellis Island. By 1893, she was an American mystery. In honour of Mother's Day - My grandmother with her three daughters. For the month of May all the historical newspapers on Footnote.com will be open to the public. A free registration is needed to view the images. 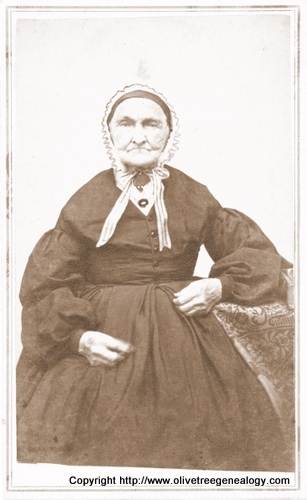 This week's featured Photo is from the Webster Family Photo Album from Lost Faces. 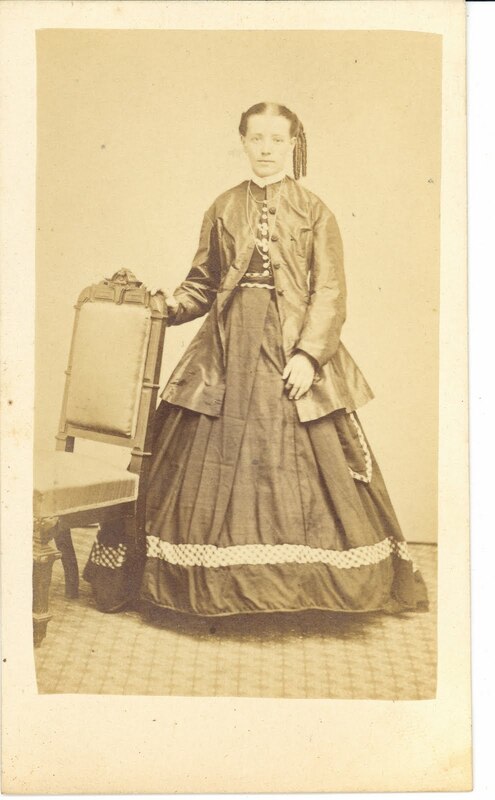 This photo is a Carte de Visite of Abigail Coleman Robbins taken in 1867. On the verso (back) is written "Abigail Robbins, 91 years old, Dec. 24, 1867"
The records can be found at FamilySearch’s Record Search pilot (http://pilot.familysearch.org/, click Search Records, and then click Record Search pilot) or Beta.FamilySearch.org. http://beta.familysearch.org/ Be sure to share the good news with family and friends. None of this would be possible without the great contributions of many online FamilySearch volunteers. These individuals donate the time and effort needed to make these collections freely available to FamilySearch patrons. If you would like to become a volunteer in the FamilySearch community, please go to FamilySearchIndexing.org. Many hands produce great work. Neither U.S. A. nor Canada maintained outbound ships passenger lists. There are no archived Ships Passenger Lists for ships sailing from ports in Canada to USA. However, some partial lists do exist. ShipsListsOnline is pleased to announce a new project to transcribe ships passenger lists leaving USA, bound for Europe and United Kingdom. Oh How Easy it is to be Fooled! Several years ago my husband and I looked over his genealogy. Much of it was done before we met, and I kept peppering him with questions "Where did you find this?" "How do you know this is correct?" "What's your source?" "Who told you?" He was a novice researcher and most of his answers were "I can't remember" or "My grandmother told me" or "I think I read it somewhere" We did manage together to track down most of the sources for his lines. And he became really conscientious about noting his sources. From this we calculated a date of birth as 26 Dec 1823. This may not be exact, for we do not who had the tombstone done. It was probably her husband for he outlived her by another 10 years. But it may have been someone else. How knowledgeable were they? Maybe they knew her exact age, maybe they did not. But it was a start. I'll keep my long story short and just say that for various reasons we had her parents as Cornelius Kennedy and Elizabeth Clifford. Cornelius was the name given to one of Catherine's sons. Cornelius was from Co. Kerry as was Catherine. Cornelius and his wife are buried beside Catherine in the Cemetery. They all lived near each other in Ontario Canada. In the 1861 Canadian Census, Cornelius and his wife have an 18 year old daughter named Catherine. The age is off, but we all know we can't completely believe a census or a gravestone. So the decision was that this Catherine was the wife of Thomas Elgie. We gathered lots of interesting information on Cornelius Kennedy. He was written up in local newspapers as a man who lived through 3 centuries (born 1797 died 1901). There were photos of him. It was rather exciting to find such a wealth of detail! Then reality hit. Recently another descendant of Thomas Elgie and Catherine Kennedy contacted me and asked for information. I hadn't looked at the lines in a very long time so as I was digging through my files and notes to make sure I had every document and every source, I realized that the connection of our Catherine to Cornelius was tenuous. There were discrepancies that needed to be resolved. With that in mind I began a more thorough search. Now that all the Canadian census records are online on Ancestry as are early Ontario births, deaths and marriages, my search was much easier. And then I found it. The death of Catherine, daughter of Cornelius Kennedy and Elizabeth Clifford. But their daughter Catherine was married to John Kean aka Kane and she died in 1913. Another look at Thomas Elgie and Catherine Kennedy's children showed they named a son Peter and a daughter Mary Ann. Light bulbs were flashing in my head. Bingo. I suspect that the correct parents of our Catherine are Peter and Mary Kennedy. Given the dates of birth, locations of birth, settlement locations and burials, I also suspect that Cornelius and Peter might have been brothers. I'm itching to start researching Peter and Mary, but sad that old Cornelius, the man who lived through 3 centuries, is not an ancestor of my husband. And I'm reminded how easy it is to be fooled and how diligent we genealogists have to be in our ongoing research into our ancestors. Great news! Casefile Clues by Michael John Neill is now available to readers of Olive Tree Genealogy blog at a reduced rate. For those of you who are unfamiliar with Casefile Clues, it is a weekly How-To column of genealogy tips and advice. Michael uses his own research to walk us through various genealogy records, step by step. His analysis of the documents combined with in-depth explanations of what can be found and how to interpret the findings, is invaluable. Even if the specific set of records he discusses is not applicable to your ancestors, you can extrapolate his advice to your own genealogy challenges. I started writing Casefile Clues in December of 2008 and began self-publishing Casefile Clues in July of 2009. 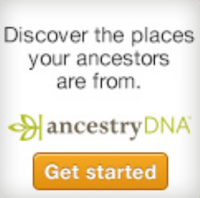 I had written hundreds of how-to columns for Ancestry.com's various newsletters for about ten years before that. I wanted Casefile Clues to focus more on the "why" and the "how" of research. There already is a lot of good beginner information on the Internet and I really didn't want to compete with that or to essentially just rephrase that information. I have felt for a long time that the amount of detailed, how-to material for the non-beginner was somewhat limited, particularly for those who choose not to subscribe to the more academic type journals. I've always been interested in the process of research, organizing the research procedure, and understanding and interpreting what has been located.Casefile Clues discusses what worked and what didn't, and where I'm going to go next. Casefile Clues is geared towards intermediate and advanced researchers. All sources are cited in the spirit of Elizabeth Shown Mills' "Evidence Explained," but final responsibility for citations rests on my shoulders. I believe in citing and try and model that as best I can in Casefile Clues. I learned a lot from the issues I read and look forward to learning more. You can subscribe for a low cost of $14.50 for a full year or for back issues at $15.00 using the Paypal buttons below. The final episode of this season of Who Do You Think You Are aired last night on NBC. If you missed it you can watch it online on NBC. I watched it and have to be honest. It was by far my least favourite episode. I loved the others, especially the episodes with Lisa Kudrow and Emmitt Smith. I enjoyed Susan Sarandon's episode too. But not this one. There were too many huge leaps and assumptions for my liking as a genealogist. I also didn't find Spike Lee someone I could relate to. He seemed removed from the process but in fairness, perhaps he was just processing the information. His love of family did come across and that was great to see. I did find it eerie that his grandmother suggested he name his character Mars in his first big hit movie, and then it turned out that Lee's great great grandfather was Mars. His grandmother suggested the name after a "crazy uncle" she remembered, but had no idea her own grandfather's name was Mars. I liked Spike Lee's perception that it was Mars himself wanting to be known that caused his grandma to toss out that name.